Mix everything together for Vinaigrette with a whisk in a small bowl and set aside. In a Large bowl Combine Pork, Green Onions, Ginger, Garlic, Soy Sauce, Sesame Oil, and Black pepper in a combine, combine thoroughly. 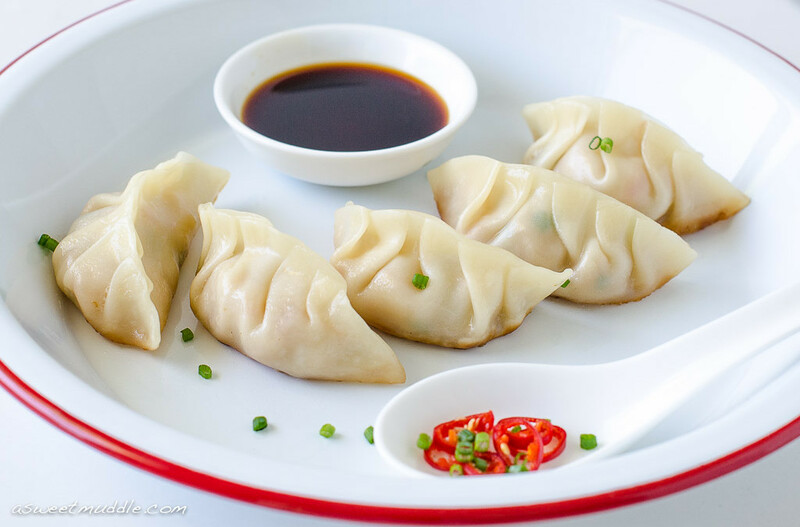 Place about 1 and 1/2 teaspoons of the meat mixture on the dumpling/pot sticker wrapper and using a wet finger circle the wrapper edge to wet it and press the sides together to create a sealed dumpling. Pan Fry: Over Medium heat, heat some canola Oil in a large skillet and gently place the formed dumplings in the pan and cook turning to get all sides in the hot oil, until outer wrapper is golden brown. Serve drizzled in the Vinaigrette, and sprinkled with the Black Sesame Seeds or simply serve the Vinaigrette on the side. Enjoy!